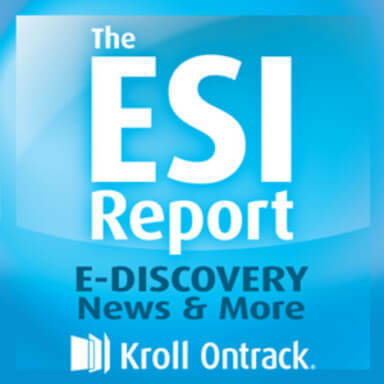 In this edition of the ESI Report, host Gina Jytyla, Managing Staff Attorney in the Legal Technologies division at Kroll Ontrack, welcomes Alan Brill, Senior Managing Director for Kroll Ontrack’s Information Security Services, and Steve Baird, Managing Director for Kroll Ontrack’s Information Security, Computer Forensics and ESI Consulting Group, to discuss pressing information security concerns. Specifically, the discussion addresses how to protect your sensitive data from the growing risk of data breaches and explores best practices in responding to a breach incident. In the Bits & Bytes Legal Analysis segment, Kroll Ontrack Legal Correspondent, Kelly Kubacki will take a look at the order issued in Pinstripe, Inc. v. Manpower, Inc. and the important issue of litigation holds and preservation in discovery.